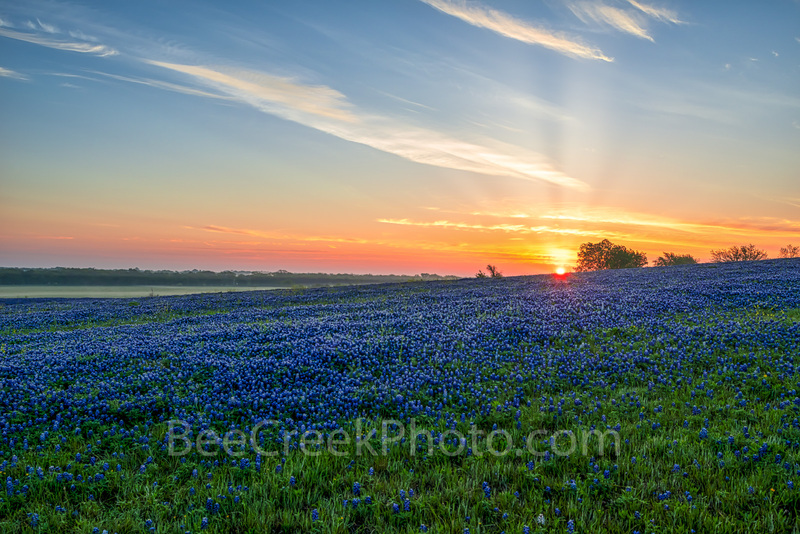 Blue Bonnet Sunrise - Sunrise over this Texas bluebonnet landscape in this pasture were an impressive site. We got there early so we saw the morning mist over the field of flowers as the sun rays came up over the horizon and the sky lit up with color on this ranch near Ennis Texas in spring with this field of blue this spring. Texas bluebonnet images are a major toursit attraction in the state and draw people from other places just to catch a glimpse of these wonder texas landscape through out the lone star state. Photo © copyright by Bee Creek Photography - Tod Grubbs / Cynthia Hestand.